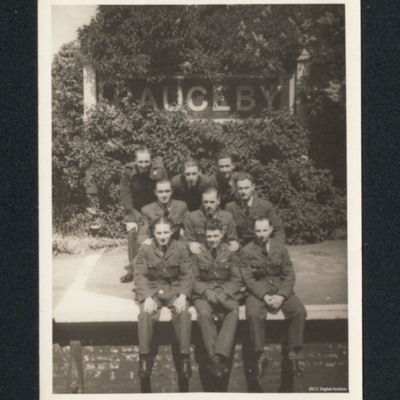 Nine airmen, wearing tunics, in three rows sitting, crouching and standing on a railway station platform in front of a sign for Rauceby. On the reverse 'AVC, 1946, Leaving Rauceby for Cardington (Demob)'. 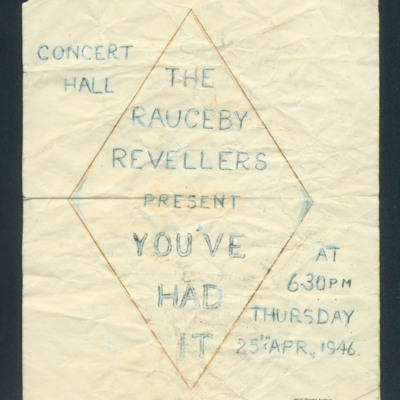 Amateur theatre musical review programme for musical review 'You've Had It' performance by the Rauceby Revellers on 25 April 1946. Includes cast.